Horace and Pete (2016) | Written and Directed by Louis C.K. HORACE AND PETE has given the writing world an event to celebrate: the birth of Web Series Theatre. Louis C. K.’s new series not only works, it revolutionizes the present by recycling the past. When I looked around for something to compare it to, I first matched its 60+ minute episodes with multi-camera TV shows, but this is not a sitcom. Like a first-person novel, the language projects rich metaphors and word-pictures on our imagination, but they’re acted, not read. Like a play, the dialogue crackles with repartee, then segues into 20-minute speeches of vivid demi-poetry, all bracketed by poignant, long-held silences. Yet it doesn’t really feel like theatre, because it’s not live. 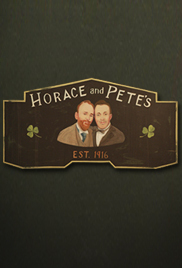 Episode 3 brought memories of MY DINNER WITH ANDRE, a famous two-man stage play adapted to the big screen, but HORACE AND PETE isn’t cinema by any means. Finally, my friend, Joel Bernstein, offered this idea: Louis C. K. is the Eugene O’Neill of the Internet. O’Neill’s LONG DAY’S JOURNEY INTO NIGHT, for example, dramatizes the Tyrones, a family slit with self-inflicted wounds. O’Neill creates four distinct, mutually antagonistic characters, and then embeds in each an ancient symbol: Behind the mask of the narcissistic, ham-actor father, James Tyrone, hides a Tyrant; his wife, Mary, a delusion-ridden morphine addict, is at heart an Earth Mother; their alcoholic, self-hating son Jamie plays Cain to his super-sensitive brother Edmund’s Abel. To dimensionalize each of his four characters, O’Neill injected an archetype with a dose of modern day neurosis. The result explodes inner contradictions that fascinate. Ever since he took stage as a standup, Louis C. K. himself has been a walking, talking existential crisis. His shows have made oldfangled angst fashionable again…but with a difference. Last century modernist authors like Samuel Beckett (Waiting for Godot), Jean Paul Sartre (No Exit), and Eugene Ionesco (The Chairs) placed highly symbolic characters in highly symbolic situations to pronounce highly symbolic ideas. But that was then. Horace and Pete haven’t the energy to symbolize anything. C. K.’s characters don’t represent the existential crisis; they live it. Specificity unlocks credibility and credibility opens the door to involvement. If Louis C. K. (who produces, acts in, and directs his own writing) has a diagnosable neurosis, it’s perfectionism. HORACE AND PETE conducts a master class in the “telling detail”. It’s as if every character’s life history has been plotted back to childhood and beyond, every trait of characterization puzzle-fit with every other trait, and every word of every line cut and polished like a diamond. As a result, from the first gesture on, each episode’s compelling credibility grabs you and holds you. In the Poetics, Aristotle says that the theatre gives two kinds of pleasure: emotional and mental. In the first case, drama releases tears, fears, and glees that we normally bottle up and never express in public. But daily life not only smothers feelings, it also barricades the mind. So the mental pleasures of the theatre don’t release, they penetrate. We sit at a fixed distance to onstage action so we can do in the dark what we can’t do in the light: We pierce the surface of behavior and read the hidden truth of human nature, complete with subconscious motivations, contradictions and complexities. This aesthetic education pays off in life with powerful insights into our own humanity and the humanity of others. Neither of these pleasures are possible, however, if the audience does not trust in what they see. The last thing an author wants is a reader or audience arguing with the believability of her story. Specificity (the telling detail) unlocks credibility and credibility opens the door to involvement. In keeping with this principle, HORACE AND PETE delivers two wonderful pleasures: we learn about people we could never otherwise know, while feeling in ways we’ve never quite felt before. Star casting can jeopardize involvement. The unfortunate HAIL CAESAR!, for example, could not separate its stars from their characters, and rather than finding that ironic, we just disconnected. To be fair, HORACE AND PETE has moments when we suddenly glimpse, “Oh, it’s Edie Falco!” or “Oh, it’s Jessica Lange,” but in the next instant, the stars slip into their roles and we relax into belief. This may mark the difference between big and small screens. In a movie house, actors are literally bigger than life, so if they don’t keep their performances in check, the star-ness of their massive projections taints the credibility of their characters. But when you hold the cast in your lap, the actors’ personalities recede to let their fictional selves surface quietly and naturally. Of course, the cast of HORACE AND PETE has acted on screens and stages of all sizes, so the seamless depth of their naturalism may simply be what happens when skilled talent gets a chance to perform inspired writing.